The Dufour kids played restaurant in the basement with a play cash register, play dishes, and a make-shift counter. With a large family, a mom who cooked like there was no tomorrow, and a dad who sold restaurant equipment, their destiny was laid out early in life. 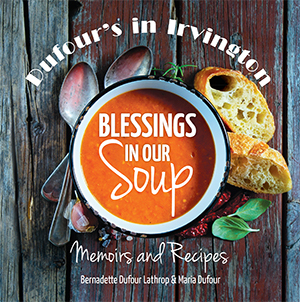 Follow two of the Dufour siblings, Bernadette and Maria, as they take you through loving memoirs and recipes collected from family and friends and used at Dufour’s in Irvington, a neighborhood eatery. Read about mouthwatering delights that were created for the restaurant and a laugh or two that went along with each recipe. Enjoy old photos of family, friends, customers, and staff. Follow the progression of how Dufour’s in Irvington evolved through the years.